The Call for Papers for the PLE Conference 2013 is out! We are happy to announce that the PLE Conference 2013 will be held in Berlin & Melbourne 10-12 July 2013 and the special theme in 2013 will be: Personal Learning Environments: Learning and Diversity in Cities of the Future. The PLE Conference intends to create a space for researchers and practitioners to exchange ideas, experiences and research around the development and implementation of Personal Learning Environments (PLEs) – including the design of environments and the sociological and educational issues that they raise. Personal Learning Environments (PLEs) are an approach to Technology- Enhanced Learning based on the principles of learner autonomy and empowerment. PLEs include methods, tools, communities, and services constituting individual learning infrastructures or ecosystems which learners use to direct their own learning and pursue their educational goals. This represents a shift away from the traditional model of learning based on knowledge transfer towards a model of learning based on knowledge construction where learners draw connections from a growing pool of online and offline resources to plan, organise, engage in, reflect on and evaluate their learning and development. By focusing on the enhancing learning of individual, yet interconnected learners, the PLE approach encompasses a diversity of learners, tools, perspectives and knowledge. So far Personal Learning Environments have been designed and implemented in formal and informal learning contexts, such as school and higher education, work-based learning and in-company training, and in continuing education. The potential of Personal Learning Environments for crossing the boundaries of traditional learning contexts, connecting diverse communities and infrastructures has not been fully realised. Therefore, the 4th PLE Conference in 2013 aims at taking the discussion on Personal Learning Environments a step forward, providing a new impulse for PLE research and development. The theme for the conference is learning and diversity in cities of the future. In view of the “Smart City” concept and the key priorities for research and innovation expressed in the EU Horizon 2020 framework, innovative, sustainable and inclusive solutions become crucial not only in terms of future and emerging technologies but first and foremost in terms of (i) human knowledge and skills, (ii) diverse and inclusive communities, as well as (iii) learning and knowledge networks. Hence, new forms of connected, interdisciplinary learning and cross-boundary cooperation are seen to play a critical role in the development of creative solutions and in the intelligent exploitation of networked urban infrastructures. In smart urban spaces, people, organisations and objects become interconnected by means of new technologies and media, forging new patterns of cooperation, production, research and innovation. What shapes can Personal Learning Environments take to support diversity, cross-boundary learning and interdisciplinary transformation of urban spaces? How can we design and implement Personal Learning Environments as part of highly interconnected social and technological infrastructures of smart cities? What technology-enhanced scenarios can be envisaged to enhance learning and diversity in cities of the future? For more information about the Call for Papers including submission themes, formats, important dates and guidelines for submissions, please have a look at the pages “Call for Papers” and “Important Dates”. We will be happy to welcome you all in Berlin and Melbourne! With the sponsorship of UNICER we will have special prizes for the best 3 photos that portray a Super Bock beer bottle at the Conference reception. 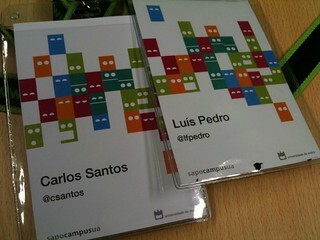 You just have to publish the photos in Twitter (with the #PLEConf hashtag) or in Sapo Campus to be able to win an amazing prize. Aveiro is the city where sun and wind meet. Yes, we have sun. Lots of it. But we also have a (not so) nice wind that, day and night, reminds us that perfection doesn’t exist. So here is the weather forecast for the next four days. We won’t have rain, so you won’t need an umbrella… but don’t forget to pack a coat or a sweater! 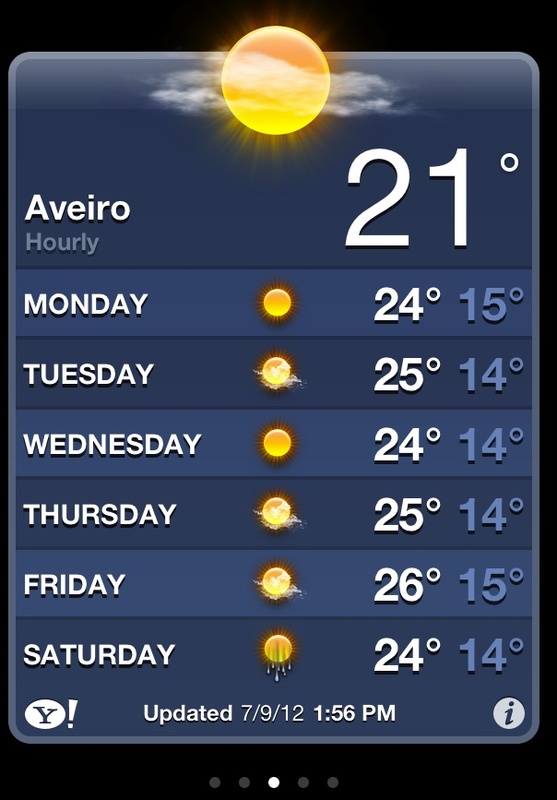 See you in two days, in Aveiro! How will you introduce yourself at #pleconf? Time to get creative! Attending a conference in 2012 is no longer the big unknown it used to be. The conference scenario in 1997? You would travel by yourself to an unfamiliar destination, to meet a group of strangers with whom you would be locked into conference rooms for several days, listening to the same speakers. If socially adept, you might have broken the ice with the person sitting next to you, with a nod. Or by talking to the person accidentally seated next to you over lunch, or at the conference dinner. If you happened to have enough in common, you might have exchanged business cards, and post-conference you might email. If very geeky, you might have joined the same email list. Fast-forward 15 years and it is a totally different experience. Connecting now happens up front! Many conferences set up their own sites to enable connections, or use Twitter, Facebook, LinkedIn or other social media. And if the conference organisers don’t set this up, then a small group of active participants will! You actively search out those people who share your interests and ensure you meet up on arrival. And once these connections have been made, on Twitter, LinkedIn, blogs, Facebook and more, people immediately become lasting nodes in each other’s networks. Of course the PLE Conference has always begun this process early. 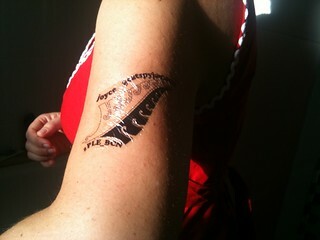 This year the #pleconf hashtag was coined back in December. And participants can now log on to SAPO Campus and create their social hub there (as easy as logging in with your Twitter account), and begin collecting the all-important badges! So we will all get to know each other well before arriving in Aveiro or Melbourne. Transitioning from digital to face-to-face! However, although we know each other’s digital identities, a little work will still need to be done to transition from the digital to face-to-face. Even if someone’s profile picture is a picture of themselves, it can sometimes still be difficult to put a name to that picture. 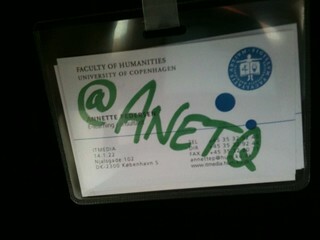 So, it will be up to you to help people recognise you, at the conference, by making a name badge. Be constructive, be creative, be clever. A pun on your avatar picture? A play on your Twitter name? This is a great tradition set at the first PLE Conference in Barcelona in 2010, and previous contestants have set a very high standard! Take inspiration from the images on this page. And yes, of course there will be virtual badges to be won for the most creative or outrageous name badges! After all, what is more personal than how you introduce yourself? PLE Conference Badges, a gallery on Flickr. We thought a lot about the physical spaces to use for the Aveiro venue of the PLE Conference. Spaces can help to boost informality and participation. So… we need informal spaces where people will be able to configure the room, draw, build and interact! And the best place for that in the University of Aveiro is… “catacumbas”, the main space for our colleagues of Design! Catacumbas | University of Aveiro from danizep on Vimeo. Our great thanks to Álvaro Sousa and Helena Barbosa for allowing us to use these facilities for the PLE Conference! And a huge thanks do Daniel Rodrigues for producing this video… just for us! We are glad to announce that we will have some rooms available in the University residences for Friday – July, 13th. If you have limited travel options and you need to stay that night in Aveiro, hurry up – we only have 12 rooms! You can start your registration and select the accommodation options here. We have a small delay on getting feedback from reviewers. It’s a hard time of the academic year for most of us and we do understand that reviewers are doing their best. We will try to have this task finished during this week. Any author will be able to do the early bird registration until 2 days after the final result communication.